The way back is so easy and yet it always amazes me when I arrive. I was there just yesterday, driving up a familiar road whose number I cannot even name. I have traveled it so many times I need not make note of it but instead seek the turn with the thrill of returning to its winding and desolate path. For most people there elicits a complaint if they are somehow forced to take this course and they prefer the rapid transit that Interstate 25 has to offer. I always choose the other, albeit longer route if I am given half a chance, there is something in the open spaces which I require for my happiness and there is far too little of it in my life at the moment. I need the silence and the uninterrupted landscape of rolling hills and distant mountains, the wide open sky and the windswept plains. This road is one of ruin and there are few people who remain to populate the many miles it crosses. It takes a windy course for a moment after it leaves Corona, New Mexico, following the narrow canyons I suppose, seeking always the path of least resistance. There are some houses on the edge of town but most of them are vacant and crumbling with age and only a few are inhabited. Even the town itself is deteriorating and if not for the railroad and the highway would be hard pressed to survive. It is fifty something miles back to Carrizozo and even further to anywhere else and the nearest Wal-Mart (sadly, the best measure of remoteness) is ninety away. From Corona the road begins to straighten out and soon finds its footing on the rolling grasslands of central New Mexico, high plains covered with brittle yellow grasses and scattered cholla cactus and little else, rolling into and out of the low pinion juniper forest of the region. The next and only town is Cedarvale, or what is left of it. The little apartment size wood cook stove which warms my bus came out of the museum there when they finally disassembled it. I bought it from a junk dealer in Capitan for $200.00 and gladly transported it home. The stove is in wonderful condition and I am proud to know its heritage. It saddens me to think that so much of the other history which was stored in the museum may have found less recognition and appreciation even if every piece was a treasure in its time. 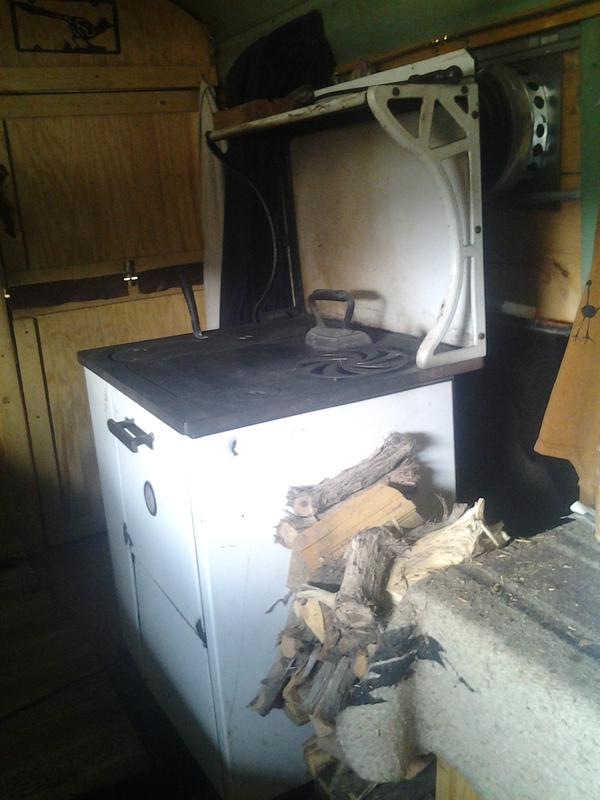 I imagine that the stove, as with so many other items, may well have traveled by wagon to its destination and that it heated many a meal for some struggling family. Life in Cedarvale would have never been easy even if the town boasts a large schoolhouse from its glory days, though even that is now crumbling to ruins. The remainder of the community is doing the same and so many of the homes; including the ones which are still being lived in, appear uninhabitable. The only well kept building in which is visible is the church, a testimony to the faith which has kept the place alive. After Cedarvale there is nothing but rolling plain and open sky for many miles, except for an occasional barn or adobe ruin to remind us of the other survivors who once settled there. I have at one time or another stopped and explored most of them, trespassing but unable to resist the allure. I am respectful all the same and I have learned to leave behind the treasures out of respect for the past, it is all that is left of it now but for the memories of the people and relatives who lived there. I have always envied them the simplicity of their lives and in spite of a deeper understanding which I have gained in regards to their challenges some of the romanticism of that vision still remains. I would trade their struggles for mine still yet even if it would have foreshortened my life, or not so it seems. The stresses of our modern day life lead to other ills of equal consequence and the ailments we live with now are surely a product of the perceived comforts we seem to so require. Those who lived before could not even comprehend what we deem as necessity, let alone entertain the sacrifices we make to attain them. I have always thought I would have been better off in earlier times and I am as assured as ever of the wisdom in that. Further up the road before the next town there is yet one more cluster of crumbling buildings, barns, corrals, a bunkhouse and a home. They sit back from the road a ways and the gate is locked. I have met the gentleman who runs his cattle there and he is himself a descendant of those who came before him to this arid open space. I have trespassed there more often than anywhere else though at least now I know the caretaker and feel that I have some semblance of permission to return, which I always do. I have asked after the place and have been invited to stay. I could preserve what is left and oversee the cattle and I have been so tempted to do so! The house is still habitable even if in need of great repair as the rats have made it their domain and part of the roof has caved in where it leaked, but the rest of the place is still secure. Perhaps only I can see the potential but I have lived in similar places. As is my habit I stopped and parked my truck by the gate. I had a friend with me and I had to persuade him to join me as I walked to the house. He had already drank far too much alchohol and even if he is normally as curious and adventurous as I am it took some effort to convince him. In the interim I stood in the wind and breathed in the peacefulness, as always allowing the feeling to envelope my spirit and sweep away everything but the pure essence of the moment. The wind lifted my hair and caressed my cheek with as gentle a touch as any lover had to offer, kinder even as there was no danger in opening my soul to its gentleness. Even if the place itself reeks of utter solitude there is no loneliness there, not in the moment anyway and the allure overrides such concerns when I consider everything I could leave behind. Chaos is displaced by necessity and purpose in such places and is uninvited. Even when unlocked the gates serve as a barrier against all that the outside world represents and they hold within them almost everything I require for my happiness. My spirit rekindled I talked my friend into joining me and even his energy returned when he too felt the wind on his face, its healing qualities overriding any poison it came in contact with. Refreshed, the wonder returned immediately and he as I marveled as the young calves bounced off away from us in wonder at our presence. We walked the narrow tracks to the house, stopping to admire the old tractor seat swing, hanging off of ancient metal chains heavy enough for work, suspended on two grey posts and an old crank handle. The children’s laughter still echoed as the wind swung the empty seat and he spoke to them before I did though we both could hear their voices. This man, he hears what I hear as so few others do and he as I feels the same wonder of the freedom in such places where others only see ruins……even if for so many other reasons neither of us could share it over the long term. If I came there to stay I would come there alone, I know not a single other person who would live there! We explored and I showed him all of the hidden treasures I have discovered in my other travails. There is a root cellar, which from the surface looks to be an outhouse. There is just a small structure above ground, a doorway and four walls but behind them there are stairs, draped with cobwebs and dust from the years of unuse. I beckoned him to follow me before I quickly went down the stairs, not waiting for him to resist or complain. He surprised me by joining me as anyone else might have protested, the entry looking so forbidding. Instead he marveled as I did at the history of the place which adorned the walls and shelves. Cardboard was draped from the ceiling where it had been tacked to keep out the wind and dust, old canning jars lined the shelves and there were old contraptions which neither of us could even find a purpose for, though they were certainly useful in their time! There was even an old rocking chair which had surely been well used, as was the old metal bed frame, folded but ready for some sultry night when the air was too hot for sleep anyplace else. We perused the barns and then went to the house, the door unlocked as it is better to offer entry than to have it be forced in such an empty place. All of the valuables have long since been removed from the house and there is now very little left, the progression of the years has taken its toll though I hope some family members have saved some of the memories. Once again my friend pleased me with no negative comments, stepping over the refuse of rat and raccoon who have taken up residence in the absence of any human presence. He as I knows that they would leave if we returned and he commented on the same, seeing as I do the ease with which the three best rooms could be cleared and restored to livable condition. We sat on the couches and discussed the same and relaxed in a manner we so rarely chance to do. The silence offered a richer atmosphere than any music or entertainment could provide and we talked as we so rarely do of the dreams and possibilities such a place had to offer. Perhaps in a different life we could have shared this place and all of the efforts it had to offer but his life is different than mine. I can still see the value in the task but he has no perception of it, his Native roots have taught him a resistance to the very things which might preserve his life. I want to farm and work, all he seems to want is to drink…..and dream of a better life. We sat. I dreamed of everything I could accomplish there and how I could focus my energies on the simple efforts of survival, to write and do my art for income, to garden and farm for every sort of nourishment that it could provide, and to ride my horse in the wind when I had the extra time. My friend sat and told me stories and spoke of the dreams he owned also. Peaceful places have a knack for that, when you are so far from everything else which might worry or trouble you and the truest essence of life flows back in its place, as if some sort of magic still exists between that gate by the roadway and the many miles between the place and the nearest town or person. Utter and complete solitude, yes, and not even the whoosh of a car on the highway as the road is barely traveled, simply a paved connection from one place to the next and necessary only because they are named towns along its route. Even now they are nearly gone, the holders on are there because of inheritance, not even by choice and I am the rare bird who would even wish to live there. So it is that I have found my way back, even if I also had to leave. I have considered it more than once, that I could go and stay there. I have also thought about the consequences of doing it alone, and how at some point I might become lonely; or not. It seems that with the passage of the years I have found more comfort in my solitude than in anything else, casting away the distractions and seeing through to the pure essence of things, capturing them in my words and being so satisfied by the same! 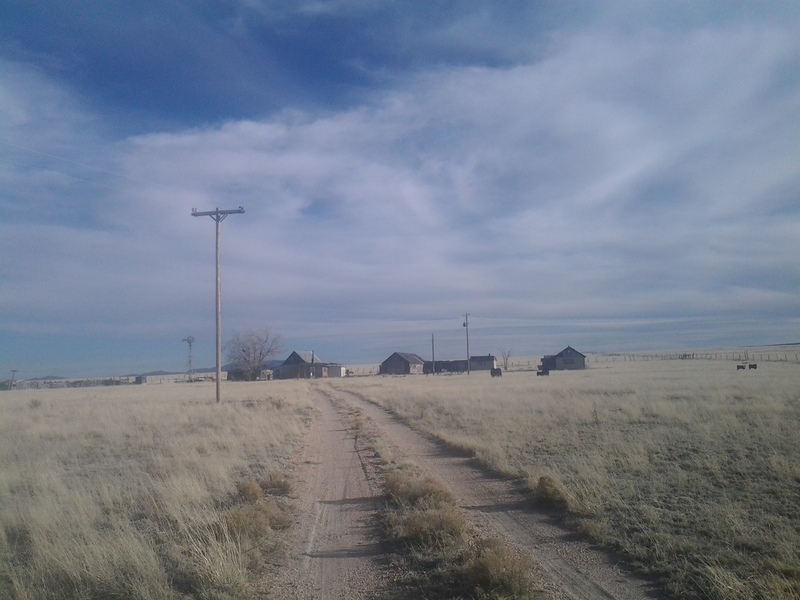 There is a purity in that which I find in so little else, excepting those old vacant ranch houses and on occasion in the drunken laughter I share with my friend. Sadly, he needs the alcohol to take him there; I just need a winding road and the open sky. I have yet to find the shortcut, he has gotten lost because he has. I can find the way back; I hope he can somehow do the same! I think that dreams are needed for us to move toward a better place in our life. Keep on following your dreams. I have the following belief about dreams. A dream that has possibilities and when one puts out the effort needed to achieve the dream, it is a Worthwhile Dream. A dream that has little or no possibility and when one waits for things to happen ( that makes things much better than they are in the present reality) and does not put any effort into making the dream happen, it is a Delusional Dream. I so agree and it is my dreams, and the efforts that I have put towards the fulfilment of them that has made my life the wonderful journey it has become. As always your sage advice, and the way you have lived your life, offers both affirmation and encouragement. May your dreams be fulfilled and well lived also!